Find out how the Great Recession impacted your state. The Great Recession had a profound effect on American communities big and small, with hardly any corner of the country passing through the period without an impact. However, there are some states that are doing much better than others, according to a new study from GOBankingRates. The study examined how each state has changed since the Great Recession, which lasted from 2007 to 2009. 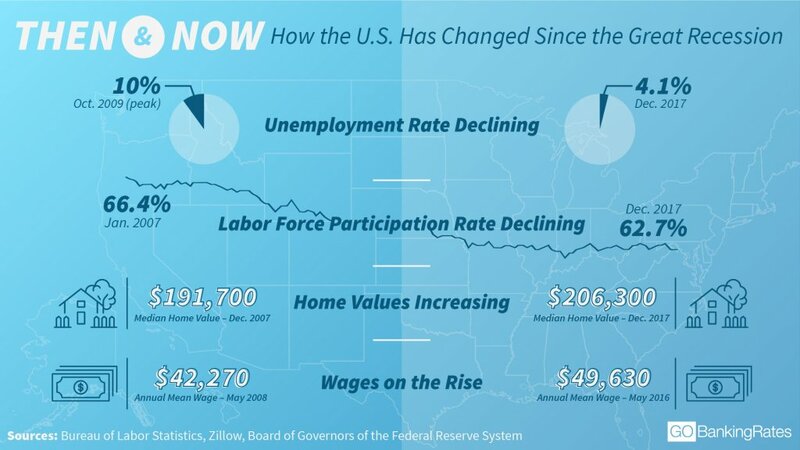 The following four key metrics were analyzed: wages, unemployment, labor force participation and median home values. The results show that many states have improved in different areas since the Great Recession. But in some states, that isn’t the case. The labor market, for instance, illustrates just how different the effects of the recession could be for different states. Take Alaska and Michigan, for example. In 2007, unemployment in Alaska sat at 6.4 percent — the second-highest rate in the country behind Michigan’s 7.3 percent. By 2009, Alaska’s unemployment rate had increased to 7.8 percent. While that was a nearly 22 percent jump, it paled in comparison to the situation in Michigan, where the high unemployment rate more than doubled to 14.9 percent by 2009. Fast forward to 2017, and Michigan is one of the most improved states since the Great Recession when it comes to unemployment. By 2017, the unemployment rate had fallen to 4.7 percent — a 36 percent drop. Meanwhile, Alaska is one of the least improved. In fact, the unemployment rate increased to 7.3 percent in 2017, which is a 14 percent increase. Methodology: To determine how the Great Recession affected each state, GOBankingRates analyzed (1) wages based on Occupational Employment data from the U.S. Bureau of Labor Statistics, (2) median home values based on Zillow data, (3) unemployment rate based on BLS Unemployment data and (4) labor force participation rate based on BLS Labor Force Participation data. Louisiana was excluded from this study due to insufficient data. These states are ideal for wealthy residents. Find out which countries are best and worst for the unemployed. 9 Years After the Great Recession: Where Are We Now?